Recommended for working on heavier parts. Supports weights up to 75 lbs. at 45 degrees. Accepts any 1 inch diameter shaft to a depth of 1.7 inches. 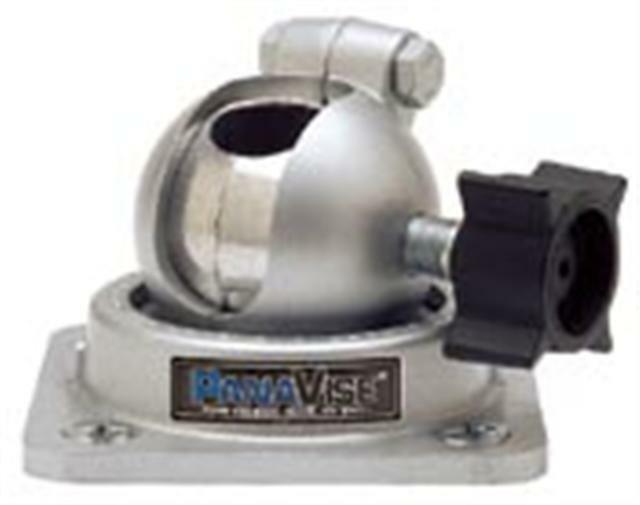 Single knob controls head movement through three planes: 90 degree tilt 360 degree turn & 360 degree rotation. Square base has four 0.3125 inches mounting holes (mounting screws not included). Internal half balls can be reversed from positive serrated lock (high holding power) to smooth friction lock (low holding power). Disassembly required. A hole is provided in the bottom of the base for a 1/4-20 flat head screw to permanently attach any device. Height: 3.25 inches. Weight: 1.5 lbs.